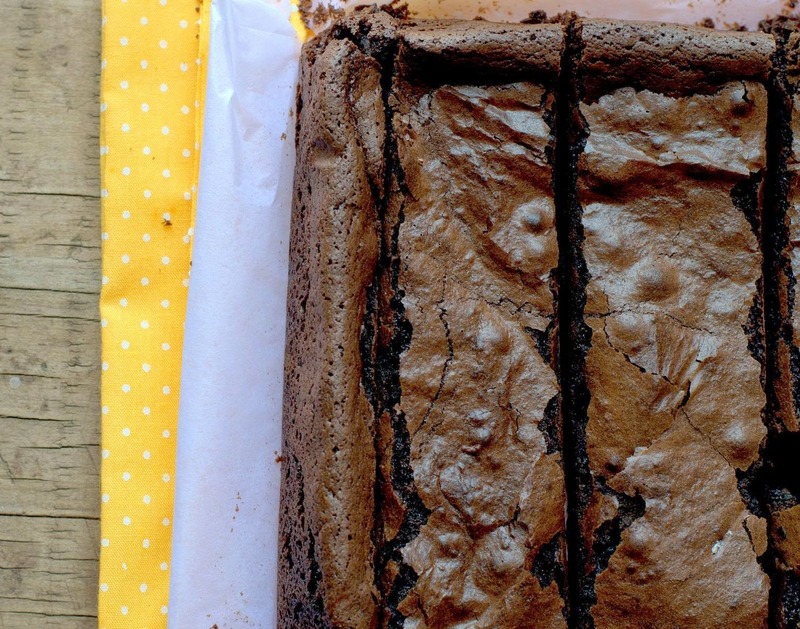 Cakes & More: Easy Cocoa Brownies - And Some Brownie Point(er)s! 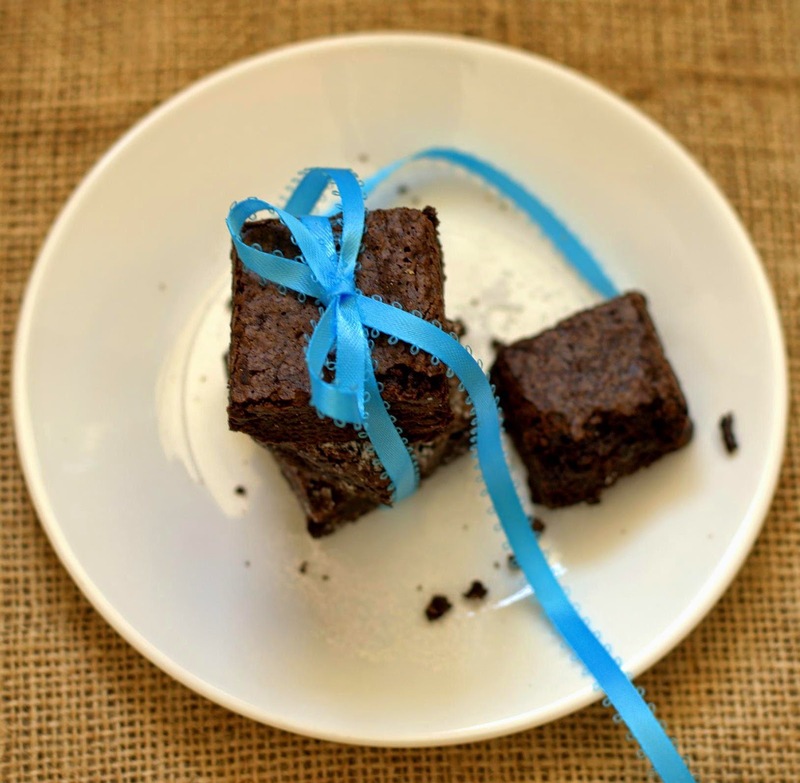 Easy Cocoa Brownies - And Some Brownie Point(er)s! America's favorite bar cookies - brownies! Unbelievably, I discovered these quite late. Basically bars, these are made with either cocoa or dark chocolate or a combination of both. My personal preference are ones made with tons of chocolate, but cocoa brownies are the easiest to start with. Brownies made with dark chocolate need it to be melted with butter just right for best texture. Brownies can be fudgy, like a candy bar or cake-y ones which are lighter or in-between the two. There are also brownies which have a dense mousse like texture. You will discover your favorite kind as you experiment. You will also discover that baking brownies will quite often be your first choice when you want to bake something easy and quick with minimal fuss. Eat as is or with ice cream for dessert. If you love chocolate, put these on your baking list! Generally, flour (or flour plus nut meal) salt, cocoa and sometimes baking powder are mixed into into melted butter or oil (and chocolate), sugar and eggs. Eggs are the leaveners basically and adding baking powder makes the brownies lighter - you may or may not prefer this. You could add some instant coffee to the batter for a more intense chocolate taste. Stir in some toasted chopped nuts or chocolate chips or swirl some dulce de leche into the batter. Recipes have varying amounts of chocolate, flour and then different methods of baking giving you brownies with varying taste and texture. With plenty of room for playing around, you will always have a new recipe you want to try! helps you cut the brownies into neat squares. 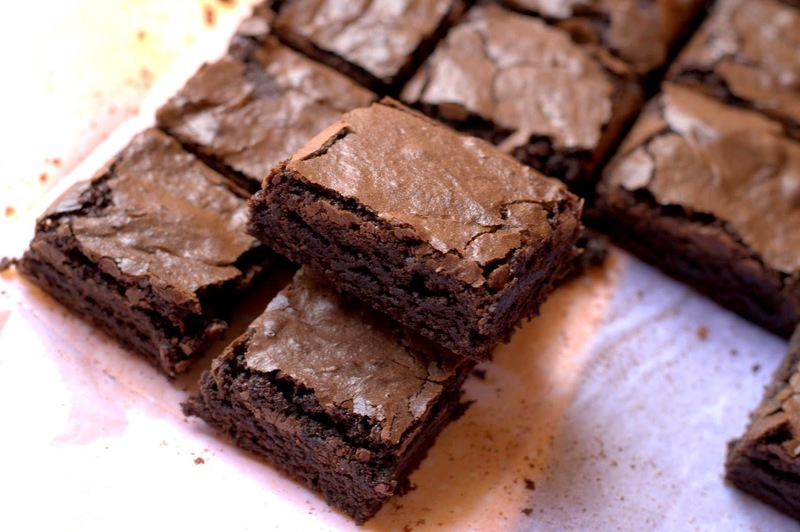 Though baking brownies is fairly simple, here are some pointers which may help. 1. THE PAN: Use the pan size recommended . Remember that using a larger pan can result in over-baked brownies, something you must avoid at all costs. Lightly grease your pan, line with foil or parchment leaving an overhang, lightly grease again. Here is how you do it. 2. INGREDIENTS : Weigh ingredients carefully. Weigh and cut the butter into cubes, get it to room temperature before melting. More of cocoa or less of sugar can make your brownies taste bitter. Using powdered sugar (of equal weight) is best. Sift cocoa if lumpy. Recipes with plain unsweetened chocolate have more of sugar, guess that's what makes them more moist. If you substitute dark chocolate like Morde in a recipe which calls for unsweetened chocolate, your brownies will be sweeter. I am waiting for my stash of plain chocolate to try one of those recipes. 3. THE CRACKLY CRUST : Melting the butter first and then sugar and butter together till its hot but not bubbling helps melt more of the sugar. This apparently gives the much desired shiny, crackly crust. I must admit I normally don't do this, but tried it for the KAF brownies. This step is only optional, your brownies will still taste good even if you skip doing this. According to Alice Medrich, the melted butter and chocolate should be very hot to the touch and need not be cooled before the other ingredients (like sugar) are added ( But I would be vary of adding eggs to anything hot). This produces greater chocolate flavor and a glossy surface. 4. BROWNIES WITH MELTED CHOCOLATE: When you bake brownies where chocolate is melted, the chocolate-butter mixture must be smooth and fluid enough. If the chocolate seizes, your brownies will not have good texture (but will still taste good). 3. ADD INS : Decide on the add in's knowing that adding dark chocolate will make the brownies more chocolaty and slightly sweeter, adding some instant coffee will help cut down on the sweetness. So will adding nuts. Butterscotch chips or milk chocolate, dulce de leche will make brownies sweeter. I like my brownies intense and just about sweet. Other add ins could be cranberries, orange zest and candied peel, a swirl of cream cheese, caramel, peanut butter etc. These are all optional. 4. MIXING BATTER : In recipes with very little flour and more chocolate, the batter is more prone to separating. You need to stir the batter vigorously long enough for the batter to emulsify. The batter should visibly become more smoother and pull away from the sides of the mixing bowl. (as in the recipe for Best Cocoa Brownies). If you do not do this long enough, your brownies may ooze fat in the oven or turn out greasy and grainy. Its fine to use a hand held mixer, especially when you make a large batch says Alice Medrich. In some recipes, adding cold eggs helps cool and emulsify the batter quickly. So, where recipes specify vigorous mixing, do not ignore it! 5. BAKING TIME: Be cautious about the baking time. Over baked brownies are still chocolaty no doubt, but for the best texture, you need to bake them just right. When you try a new recipe, you may at times find that the baking time specified is way more than you need, so check them 5-10 minutes ahead. (Gosh! Let me first check the recipes on my blog!) Ovens, voltage fluctuations etc can make a difference too. (The brownies above were already over-baked at 25 minutes, specified time in recipe is 30 minutes). Its always preferable to under bake brownies - till you see the toothpick come out with very moist crumbs or even safer a dirty looking toothpick. But not raw batter! If your toothpick comes out clean, you know you have over baked. 6. COOLING BROWNIES: Set the pan on a rack, cool brownies in the pan. Tempting though it is, cutting them warm is messy. Cover, cool for a few hours or overnight. You could cool them in the fridge or even freezer for great cuts, but I guess it also dries them out a bit . Once you cut them, bring them back to room temperature before you serve. 7. CUTTING BROWNIES: Lift the brownies out of the pan using the overhang. Place on the counter or cutting board. Use a very sharp serrated knife dipped in hot water to cut. Wipe the knife dry before cutting. 8. STORING BROWNIES : These freeze well. Zap them in the microwave for a minute or so if the brownies are directly from the freezer. A spritz of water on them shouldn't hurt as you don't want them to dry in the microwave. Heat about 20 seconds on High if you have stored the brownies at room temperature. Serve warm with a scoop of ice cream, drizzle of dessert sauce and toasted nuts. I tried two simple recipes, one for fudgy brownies from Joy of Baking and another for slightly cake-y ones from King Arthur Flour. Since I am very partial to fudgy brownies, I shall recommend Stephanie's recipe. As I totally ruined the pictures for the Joy Of Baking brownies, I will show you just one picture of those (above), the rest hidden away. Sour cream (full or reduced fat) - 1/4 cup (60 ml) I used Nestle set curd at room temperature after draining the thin liquid. Add in's (optional) - 1 cup of toasted chopped walnuts or chocolate chips or anything else you please! Procedure: Preheat oven to 160 degrees C / 325 degrees F and place the oven rack in the center of the oven. Line the bottom and sides of an 8 inch (20 cm) square pan with aluminum foil or parchment leaving an overhang. Grease lightly again. In a small saucepan melt the butter (can also melt the butter in the microwave). Remove from heat and pour into a large heatproof bowl. Whisk in the sour cream. Using a spatula, fold in the flour mixture into the batter and any then any add-ins. Pour into the prepared pan and smooth the top. Bake for about 25 - 30 minutes, or until a toothpick inserted into the center has very moist crumbs clinging to it. I don't mind a very dirty looking toothpick. DO NOT OVER-BAKE! Remove from oven and place on a wire rack to cool to room temperature or for a couple of hours. Cut into squares. So, which recipe should you try first? Stephanie's recipe for fudgy recipes would be my first choice, please follow the recipe instructions, do watch the video. If baking The King Arthur Flour recipe, bake half the recipe on the site in an 8'' pan for about 20 minutes. Do also try Best Cocoa Brownies after your first one or two trays of these chocolaty bars. My favorite brownies? Almond Brownies, Milk Chocolate Brownies, and Bittersweet Decadence Brownies. Plenty more to be tried! Please do come back later and share your favorite brownie recipe with me! I am a vegetarian by choice. What would be the most ideal replacement for eggs? Hi! How can the same recipe be done using a microwave(Grill-convection) oven?